I discuss the driving forces shaping the environment, the shifts in the IT function, and the emerging new role for CIOs. As I point out in the podcast, I believe that there is a growing divide in the roles of CIOs. Some CIOs and IT functions are being marginalized as the business leaders come to believe that technology is a commodity and that technology functions should be performed increasingly efficiently, starving them of resources. 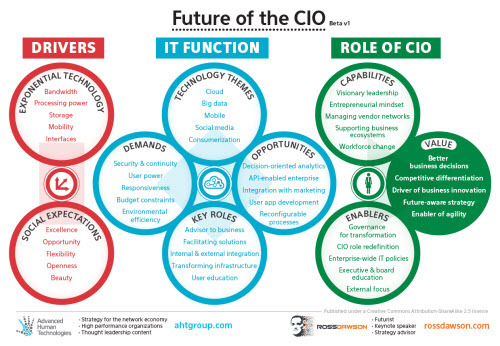 Other CIOs are leading their boards and executive teams in understanding the critical role of technology in their organizations’ future success, and playing a key role in shaping not just their strategies, but also the very nature and shape of the organization in a connected world. The Chief Information Officer used to be a functional support role. Today and moving forward it is and must be a key leadership role in driving the future of their organizations.